Hi, I’m Marisa and I blog over at The Pace of my Life. I am a wife and mom of two wonderful kids, as well as, a full-time teacher to 32 six-year olds, and I love to run (among other things)! I am currently training for The Giant Race, a half marathon in San Francisco and will be running my first marathon in December, Rock n Roll Las Vegas. This summer my husband and I were able to get away together a few times and believe it or not, we used that time to run together! It doesn’t happen too often, so we can take advantage of it when we can. 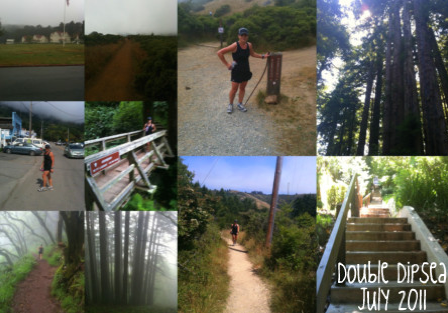 Last month, we hit the Dipsea Trail. If you aren’t from California, you may not have heard of Dipsea. It is a historic trail that travels from Mill Valley to Stinson Beach. It is a little over seven miles long and travels some pretty tough terrain. Included in that terrain are nearly 1500 steps and about 2,200 feet of vertical ascent and descent. Sounds fun, huh?! Well, we decided to do a double...Mill Valley to Stinson Beach and back! 14 miles, 4400 feet of ascent and descent! We started around two and didn't finish until after five. You can do the math, it took us a long time! During the first mile we climbed nearly 700 stairs. I felt SO out of shape! And I am pretty sure, I'm in fairly good shape. When we hit three miles, I thought for sure my Garmin was wrong and we had gone at least six miles...not so!! The trail just climbed and climbed and climbed some more. There were sections we ran, but there was a lot of hiking. We went from sunny weather to fog rolling in to the Ewok territory where it was misting heavily back to the sun peaking through in Stinson Beach. The second half was a little easier, but our legs were spent. The trail is very neat, it is beautiful, but it is brutal. Like I said, it was tough. We had nearly 4000 ft of elevation change in 14 miles. It was good...we made it, we did it! If I had a bucket list, I could cross it off my list! It was bad...I asked myself more than once how I was going to make it back to Mill Valley and why didn't we just go run in Golden Gate Park. It was ugly...my husband's quads were cramping up so bad on the way back, I could watch them twitch! And some sort of bug stung or bit my back on the way back and it hurt like heck!! I haven't had something hurt that bad since I stepped in a wasp nest while playing soccer when I was 12. And once we were done, we enjoyed a great dinner at the Buckeye Grill topped off with some S'mores Pie and headed back to a nice, comfy room at Cavallo Point. Would I do it again...not for a very long time! Would I recommend doing it, yes! It is an experience!! A big THANK YOU to Jennifer for allowing me to invade her blog for a day!! Thanks for reading and if you'd like to read more about me and my life as a wife, mom, teacher, and runner, come on over and check out my blog!! Love this, it totally makes me want to go and run some trails! Jennifer, thanks for hosting Marisa today!! great guest post. i live in northern california and running/hiking on the dipsea trail is on my bucket list of things to do someday!